Star Renewable Energy, the UK's leading renewable heating contractor, will be attending the International 2016 Low Carbon Heat and Water Conference and Showcase to engage in discussions on the subject of the future of renewable energy in Europe. What is needed now is a concerted effort from end users and advisors to see beyond short term wins that are fundamentally still burning fuels, and switch to the cleaner and more cost effective large heatpumps. Glasgow based Star Renewable Energy is renowned for its groundbreaking innovations in renewable heating; in particular, the Drammen heatpump, which provides carbon free sustainable heating for more than 6,000 homes and businesses in the Norwegian city, and is also the largest in the world. The award-winning heatpump harnesses water from the chilly fjord and converts it into zero carbon heat at up to 90°C, a feat the International Energy Agency once deemed "impossible." With 50% of the UK's energy use going towards heating, Star Renewable Energy is now advocating for the UK to adopt the use of renewable heating, and pushed for the government to maintain the Renewable Heat Incentive (RHI) past March 2016. According to research carried out by SRE, the UK could save close to £1 billion from its annual energy bill by switching from fossil fuels to Water Source Heat Pumps. Dave Pearson, Director of Star Renewable Energy, will shine a light on renewable heating at the International 2016 Low Carbon Heat & Water Conference and Showcase, during a Break-Out Session focused on innovation. SRE are no strangers to innovation, having won the prestigious Peter von Rittinger award in 2014 for the advancement of heat pump technology. In addition, Star Renewable Energy have developed a high temperature air source heatpump, which is capable of reaching 65°C whilst still being efficient enough to be eligible for the RHI even at -3°C. Pearson said, "The resources required to bring WSHPs to the UK are readily available, with several bodies of water flowing continuously through Britain, such as the River Thames, the River Clyde and the River Tyne. The UK also has a perfect climate for air source heatpumps as it is pretty mild for most of the year." "With the continuity of the RHI, the government funding and support to allow for widespread use of the proven technology to be implemented is in place. What is needed now is a concerted effort from end users and advisors to see beyond short term wins that are fundamentally still burning fuels, and switch to the cleaner, and more cost effective, large heatpumps." The one day event, taking place in the Glasgow Royal Concert Hall, is free for all attendees and is not to be missed for suppliers and customers within the low carbon heating and water sectors. The B2B Matchmaking activity will enable attendees to engage in speedy one-to-one meetings with relevant buyers and suppliers, with key representatives from Star Renewable Energy, Carbon Trust, SSE and Ramboll Energy already signed up to participate. There will also be an opportunity for all attendees to embark on a site visit to Star Renewable Energy’s Westway factory in Renfrew to see the air source heatpump in action. Guests will first visit Glasgow’s Commonwealth Games Athletes’ Village and the Sir Chris Hoy Velodrome, before departing to the factory to be given a tour of SRE’s innovative 65°C 400kW air source heat pump under test conditions. Dave Pearson will present an overview of the benefits of renewable heating prior to the visit, and will accompany the guests to the factory to answer any questions during the tour. 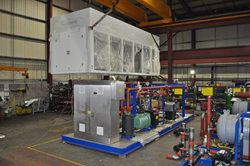 Pearson added, "We are delighted to have been selected as a showcase field visit, and will warmly welcome the guests on the additional trip on the 24th February to see the air source heatpump at our test facility in Renfrew." The International 2016 Low Carbon Heat & Water Conference will take place on Tuesday 23rd February in the Glasgow Royal Concert Hall, with the site visit scheduled for the following day. Registration is open until 19th February and registrants are able to request matchmaking sessions and sign up for the site visit. To register, visit the website.